It happens. There are certain situations out of our control that get in the way of us sticking to our commitments (those situations should not be boredom or being hungover! Read our article on what will get you excluded from future craft fairs). Although leaving a craft show early or cancelling last minute is frowned upon, if you find a way to do it properly, you can leave your good reputation intact. Below are some ideas to make the most of the situation and respectfully leave early. See if there’s a friend or family member who can come in and man your booth for the rest of the show or at least for the rest of the day. That way you’re not creating a scene in the middle of the event and distracting the shoppers from doing what they came to do…..shop! If it’s an emergency, you may have your hands full but if you happen to know a lot of vendors who participate in craft shows, you may know someone who generally has a lot of stock ready to go. Don’t go giving your spot to them without running it by the organizer first, that would be a big no-no. Kindly offer to help them out if they would like another vendor selling under the same category to take your spot. You would need to leave this option completely up to your vendor neighbor but you could ask them if they’d be willing to man your booth and you’d give them a percentage of sales. Depending on how much work you’ve put into this show and what your losses will be if you have to leave it, this may be a good option. Let them know you are extremely sorry and this isn’t the norm for you. If you want to be invited back to another one of their shows, you need them to understand that this isn’t typical for you. 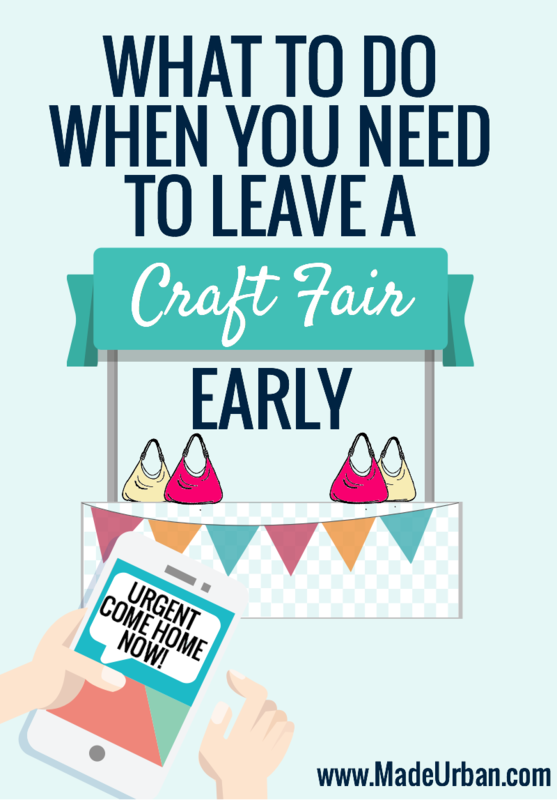 It may be a good idea to let your craft show neighbors know that you need to leave, you know it’s not ideal and you wouldn’t normally do so but it’s an emergency. This way they may be able to explain to shoppers why there’s an empty table and to other vendors that you’re not being irresponsible. If you find out between days that you won’t be able to attend the next day, be sure to get to the event early so you can explain everything to the organizer, apologize in person and pack up before shoppers arrive so you don’t make a scene. In the unlikely event that you need to leave while the event is still open, be sure you do it as discretely as possible. It’s not a very good look for the organizers to have vendors packing up early and you don’t want to cause a commotion. An empty table may stand out like a sore thumb so it may be helpful to the organizer if you helped them take down your table and (if possible) shuffle your neighbors closer together. This may not be an option if it’s busy in which case, leave your space as tidy as possible.